OIRSCHOT - Last month, DAEL Security starts a series of demonstrations of the Heuresis HBI-120 at locations of federal and local law enforcement agencies throughout the Netherlands. One of them was held at the Stevenick barracks located near Oirschot last month. This HBI-120 is a unique handheld backscatter x-ray instrument that enables users to quickly and cost-effectively find concealed explosives, narcotics, and other contraband. In cooperation with Heuresis, DAEL Security provides a series of demonstrations of the device throughout the Netherlands. During this series of demos, this device is used to apply an interactive training method in which it will be used to test in numerous situations and experiences from within the working field. The innovative HBI-120 has proven to be a highly effective tool for drug and terrorist interdiction programs conducted by federal and local law enforcement agencies. 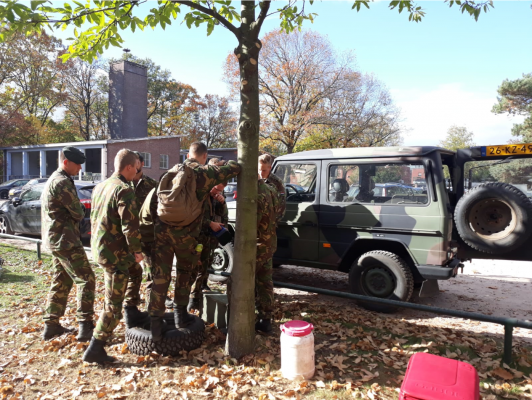 DAEL Security started a series of demonstrations throughout the Netherlands and the first one was held at the MG de Ruyter van Stevenick barracks, a military base located near Oirschot. Participants consisted of specialists within an EARS platoon (Engineering Advanced Reconnaissance and Search) which also houses regular search and genius recognition teams. These teams can, for example, be deployed in the event of a terrorist threat. In such situations, the specialized military provides a high degree of certainty for finding explosives and collecting evidence. To mimic these threats, they hid everyday items such as sugar and bananas -which have a similar chemical consistency as drugs- inside commonly used hiding places such as tires and bumpers. Another demo was held at the Masterclass ‘Detection of Prohibited Substances’ 2018 at an educational institution in Warnsveld near the Zutphen Police department. Because the HBI-120 allows local law-enforcement officers and private security personnel to quickly inspect abandoned bags and packages for threats without opening them, this could be an ideal device to use within their field of work. Specialists present at the demo put the portable X-ray scanner to the test in detecting hidden threats like drugs, guns, and explosives inside vehicles, under chairs and inside backpacks. During these demonstrations, the safety precautions for the radiation released during the use of such devices was also discussed. Heuresis’ HBI-120 is the first-ever handheld x-ray imager that enables customs and border patrol agents and other inspectors to quickly find concealed threats and contraband in motor vehicles, ships, aircraft, steel drums, trash receptacles, mailboxes and other locations. The HBI-120 weighs only 7.5 lbs. (3.4 kg) and images objects with a miniaturized, internal 120 keV x-ray generator that makes a raster-scanning pencil beam of x-rays to scan objects of interest. As the handheld HBI-120 is moved over the object, a 2- dimensional backscatter x-ray image of the object is displayed in real-time on HBI-120's high-resolution transflective LCD touchscreen and saved in the instrument’s memory. Do you have questions or comments regarding this message? Please feel free to contact sales.security@dael.com for more information. Yes, I want a good working website No, thanks!